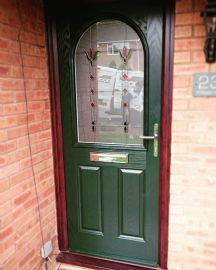 This GRP Composite Door was fitted by our installation team on Walcote Drive in West Bridgford, Nottingham. It is fully energy rated with a U value of 1.0 and meets current building regulations for nottinghamshire and the east midlands. These bespoke composite doors are designed by the customer and the high security of these doors are very popular with our West Brigford customer base. We carry out a lot of installations in and around Walcote Drive area of West Brigford not to mention the rest of Nottingham. If you require a new composite door installed in the west brigford area feel free to contact us on 01157401740.